With all the St. Patrick's Day preparations I've been making, I almost forgot that Easter is right around the corner! In my search for Easter fare, I found (yet another) Eastern European bread recipe that I fell in love with. Traditionally, a large loaf of this bread is made for the Easter table and the leftover dough is fashioned into little dolls for the children of the family. 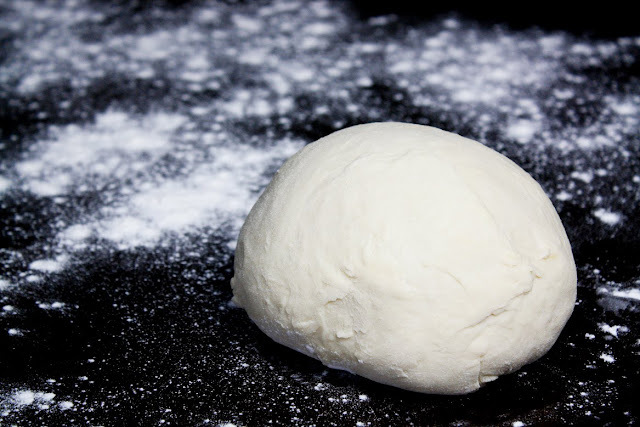 The dough itself is easy to make, but it is a yeast bread so plan ahead for rising time. While you are waiting you can boil and dye your eggs (or doll heads). 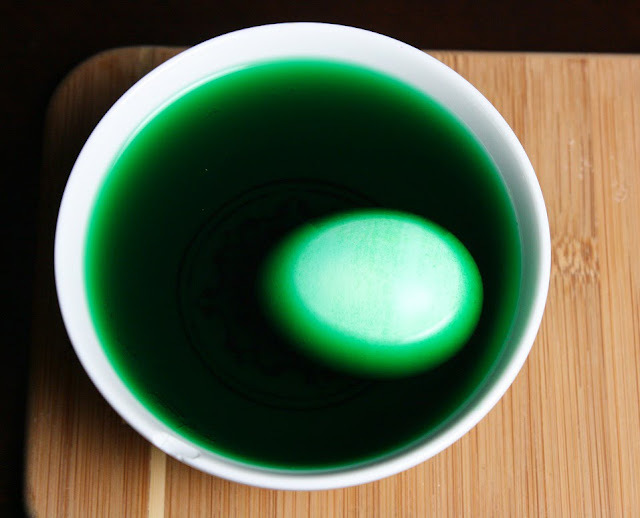 I dyed my eggs the plain, old-fashioned way. Food coloring, vinegar and hot water. My luck with yeast breads has been spotty at best, but I did just fine with this one. 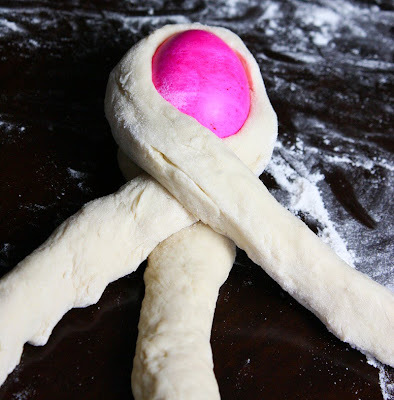 The dough is a little elastic so it takes a bit of rolling when you are ready to "dress" your dolls. I divided my dough into uneven portions, one a little larger than the other. If I had to give a portion size, I'd say a generous 1/2 cup and 1/4 cup dough. Roll out each portion until they are long and thin. You'll make a "T", with the larger portion being the top and the smaller portion being the middle. ...crossing one side over the other. It's almost as if you are wrapping the egg-head in a scarf. When all the dolls are braided, snip them evenly at the ends with a pair of kitchen scissors. 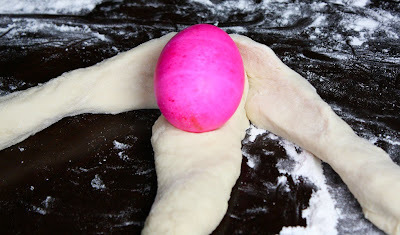 Traditionally, you would make two smaller pieces of dough to cross over the face of the head/egg. This is used to make extra sure the egg stays in place. I didn't like how it looked and my eggs were securely braided in and very stable. I like them better plain. They are usually served as pictured above... but I just couldn't help myself. Something within me could not let these go faceless! I used food safe markers to draw faces on after the breads baked. I keep Wilton color writers on hand, and they worked well. Although this bread was easy to make, I did have a couple of glitches I'd like to mention. A couple of my dyed eggs became splotchy during the baking process. They were still pretty, but not perfect. My suggestion would be to dye a few more eggs than you think you'll need. I was able to pop out the ugly egg-heads and replace them with pretty, perfect ones. Again, after the baking process, when removing the egg-head I found that the dye had bled onto the bread. If you have an aversion to food coloring then this may not be the project for you. I have no problem eating a pink bread. The egg is completely edible after baking (I had one for lunch yesterday). The bread is just slightly sweet and reminds me a little of pretzel dough, only softer. Scald milk and cool to lukewarm. Add the yeast and set aside. Meanwhile, in a large bowl or stand mixer, combine eggs, sugar, butter and salt, mixing well. Add the yeast-milk mixture and half the flour and beat well. 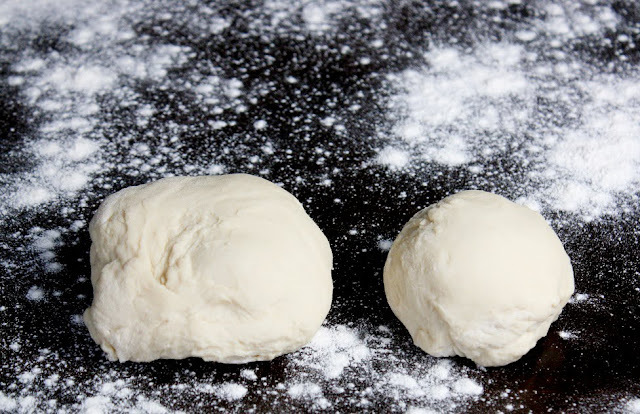 Add remaining flour gradually, until a smooth, soft dough forms. You may not use all the flour or may require more. (I used all but ⅓ cup) Place dough in a large greased bowl, turning to coat both sides, and let rise, covered, until doubled. Punch down and turn out onto lightly floured surface and knead 2 minutes. 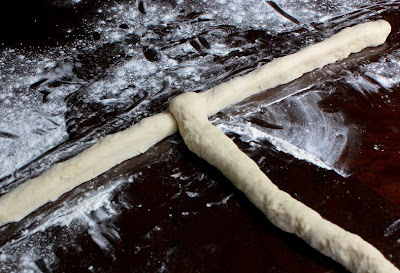 Divide dough into 36 equal pieces (divide dough into 3 pieces, then each into 3 pieces again, then each into 4 pieces). Cover and allow to rest 5 minutes. (I did the dividing a little differently - see sprinklebakes.com for more info) Heat oven to 375 degrees. Using 3 pieces per doll, roll into 3 (12-inch) long ropes. Begin by aligning the 3 pieces side by side. Put an egg near the top of the ropes. Pull the center rope down over the middle of the egg, tucking the end under. Pull the left strip over and down under the right side of the egg, and the right strip over and down under the left side of the egg. 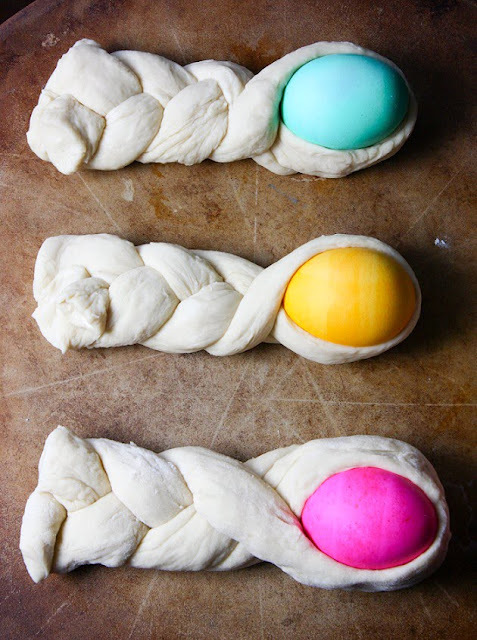 It doesn't really matter how you do it, as long as some of the colored egg shows through. 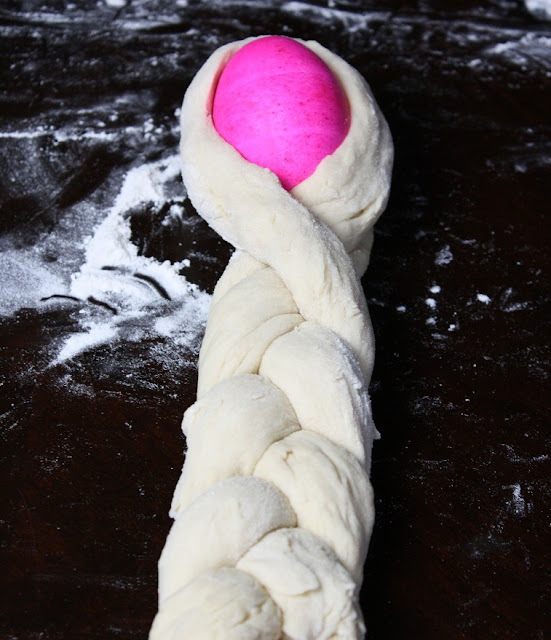 Braid the remainder of the rope, below the egg, and pinch the bottom ends together. Place doll on parchment-lined baking sheet. Continue with remainder of dough balls. Cover with greased plastic wrap and let rise slightly. Egg wash the dolls with 1 large egg beaten with 1 tablespoon water. Bake 20 minutes or until golden brown. Cool completely. By the way, the hard-cooked egg tastes just fine after being baked. The yolk might have a green sulfur ring around it but that doesn't affect the taste. Makes 12 Croatian Easter Bread Dolls. I had so much fun making these, and having some little helpers around would only increase the fun! I love learning about others' traditions and I think it enriches our lives and those around us when shared. I think that these are adorable!!! Would be perfect for a tea party! teehee, these are TOO cute!!! you always have the coolest things!! I love this idea. You did a great job. Were the eggs hard cooked before dyeing or do they cook in the oven?? Very cute. 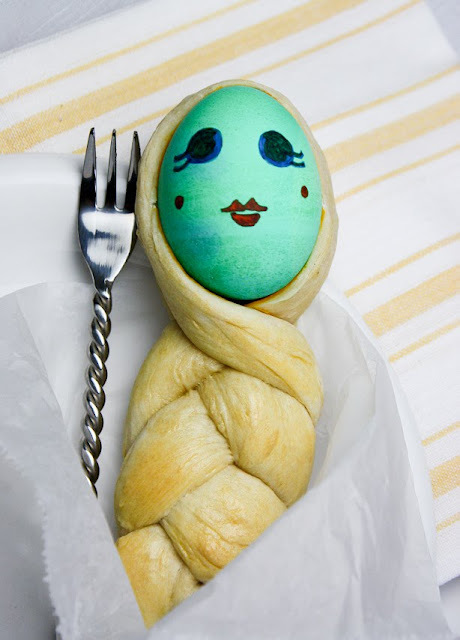 I have made a braided Easter bread with the dyed eggs before, but this dolls are adorable. Heather where do you find all your wonderful ideas? I'd love to make these with Isaac. How did the egg taste and how easy was it to peel? Was it like a boiled egg? Looks like a lot of fun! To those asking about the eggs - they are hard-boiled before baking. This is mentioned in the recipe, but I should also mention it in the body of this post so there's no confusion. The egg is really tasty! The extra time in the oven doesn't change the flavor. The eggs peel easily too. I think the heat from the oven makes the eggshell dry and brittle so it cracks easily and peels right off! Very cool! Where do you find these recipes? Oh my gosh! These are just the cutest things ever!!! 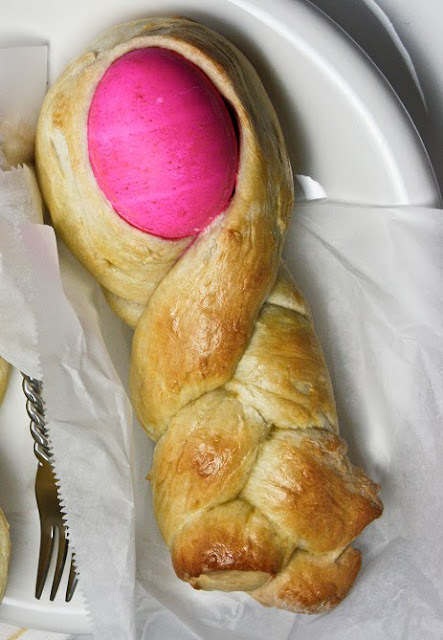 I've made challah (braided) egg bread before, and have seen eggs in a large braided bread, but never anything like this...leave it to you:) Love it! I'm going to try it too! These are soooo cute!!!! I love their little faces and that bread looks yummy! What a darling, darling Easter tradition. Thank you so much for sharing. These are just precious!! My girls will simply adore these. I'm bookmarking this now. And following for more great posts! You did a great job! So cute. I think they're a little creepy, but GOOD creepy. Ah well, what do I know? I'm Jewish. Beautiful Job! This sounds great! So cute! And they look real fun to make, the added faces just finish it all up! 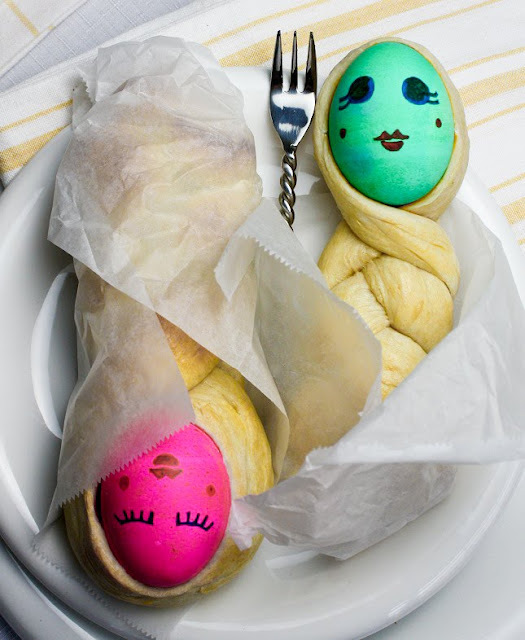 how funny looks all amazing easter bread dolls, I know that I am going to prepare this delicious pastry at home, they are so adorable at the same time, I am interested on them. Grandma of 8 looking for something 'cute' for Easter contribution to family party. Found these and immediately fell in love! I know it's awfully late to post a comment but I appreciate your post so much. I found a recipe at Epicurious but could not figure out how to shape the dough. Now I know and I'm excited to see the kids faces on Easter. Thanks! Definitely going to make these sometime! May not be able to wait until next Easter. 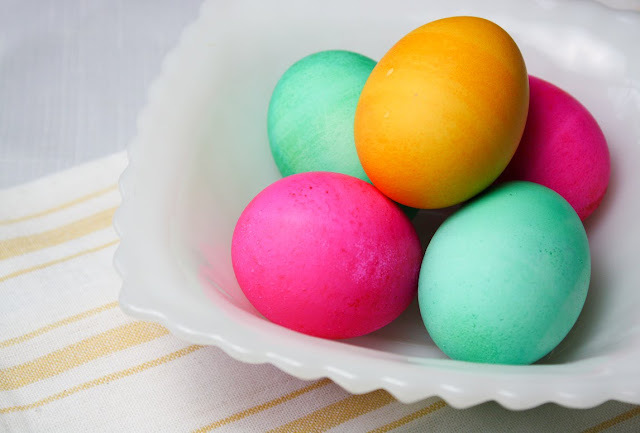 I have dyed Easter eggs with homemade dyes before (boil onion skins for yellow, blueberries for a blue-violet color, etc., strain, add vinegar) and the earthy tones you get with that would be perfect with this! this is a traditional recipe in my family, I think that you have a some variations of the recipe, excellent presentation! cute, but not in Indonesia or Malaysia, cause it looks like Pocong or Hantu Bungkus (wrapped ghost). Hi, I am from Krk, croatian island on the north of croatian coast. My grandmother bakes this bread every Easter and gives it to every child that comes to her house on that day. I am so proud that you tried to bake this bread and that you liked it. Is the recipe of bread your Italian Sprinkle bread? I don't see a link to the actual bread recipe. Or should I just use my own favorite bread recipe? Hi Debbie! The recipe wasn't showing up. I've fixed it now. You should be able to view and print. Let me know if you still can't see it! Thanks a bunch for letting me know!